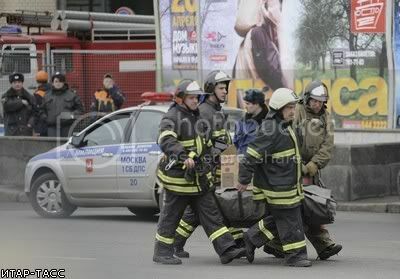 ← Two blasts in Moscow Metro, dozens killed! Moscow Russia is in a Quiet State of Shock Today! Two blasts in Moscow’s subway stations Lubyanka and Park Kultury occurred during the early morning rush hour with an interval of 40 minutes, the first one at approximately 8:00 a.m. Moscow time (5:00 GMT). According to preliminary information, at least 37 people have died and dozens were injured. I took a long walk with the dog and then again without the dog. I was watching the cops stopping people on the corners and pulling people out of businesses to question them. The store I go to and shop for food, had one employee at a time, go out side and talk to officers. Everything was calm, cool and the cops acted very professional. They without a doubt had a particular type of person they had their eyes watching for. I had covered allot of territory while walking and ended up at the train station. It was abuzz with activity. They even had several German Shepard dogs patrolling around the station. I decided not to attempt to take pictures because I think that things are tense enough all over.